Columbus houses one of the best collections of daily-fee golf courses in the country. Need proof? The defense submits exhibit A: Virtues Golf Club and Raymond Memorial. The 18th hole at Virtues Golf Club. Virtues is a 7,243-yard Arthur Hills design, and despite opening only a few years ago, is already in elite company. In 2000, Virtues (namded Longaberger Golf Club at the time) was named "America's Best New Upscale Public Course" by Golf Digest. This year, it rocketed to 34th place on Golf Magazine's "Top 100 You Can Play" list. The marvelous, expansive clubhouse, with its cathedral ceilings, sweeping vistas, and first-class pro shop is as close as one can come to that exclusive country-club feel at a public course. Hills' design at Virtues is typical of one of the most prolific -- and lowest-profile -- golf course architects of the latter third of the 20th century. The Toledo native mixes the dramatic elements American golfers are so fond of with understated accents reminiscent of classic British and Irish layouts. His green complexes, for instance, are equally likely to be guarded by grass bunkers as sand bunkers. At Virtues, Hills takes advantage of elevation changes of over 100 feet, and retains all the natural beauty one would expect from an Audubon International Signature Sanctuary. Conditions are impeccable, and a premium has been placed on shot-making, especially when it comes to iron play. 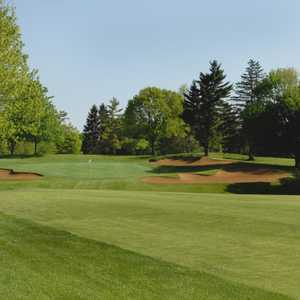 If you can't fight the crowds waiting to play Virtues, you can try another masterful course at a great value; Raymond Memorial. Designed by Robert Trent Jones, and opened in 1954, Raymond Memorial is one of the most amazing values in the country. Jones was one of the most well-known and finest golf course architects in America. When Augusta National wanted to rebuild its 11th and 16th holes, it called upon Jones. When Oakland Hills wanted its south course retooled for the 1951 U.S. Open, Jones was the man. And because he went to an Ohio State football game in 1949 with Columbus Mayor James Rhodes, he agreed to design a public course in Columbus anyone can play. 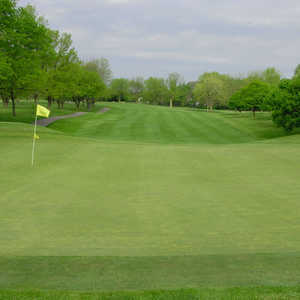 Raymond Memorial plays to 6,812 yards from the blue tees with a rating of 71.5 and a slope of 116. However, the real test comes not from the length but from Jones' subtle course design and classic touches around the greens. Large bunkers dot the landscape around each hole, and even though the greens are a fair size, the actual target areas are small. The course also features a couple of design quirks. The first is an alternate hole for each par three. Jones put them on the course to keep the pace of play brisk even at the busiest times. The second quirk is the fourth hole, a 332-yard par 4 from the white tees that doglegs 90 degrees right around trees about 165 yards from the tee. If the tees are played up, a big hitter can drive the green, but one has to knock the ball over the trees, which are older than your grandmother and taller than Paul Bunyan. 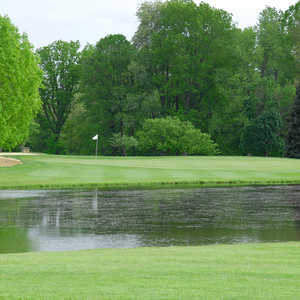 As evident from these two courses, Columbus can give golfers on both ends of the spectrum something to look forward to. They also show that Columbus isn't just the state capital, but the capital of central Ohio's golf scene. Shane Sharp is vice president of Buffalo Communications, a golf and lifestyle media agency. He was a writer, senior writer and managing editor of TravelGolf.com from 1997 to 2003.